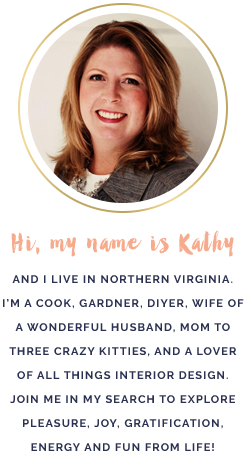 While surfing around on some of my favorite foodie sites, I happened to come across the food blogging events page at Is My Blog Burning. Now, for those of you who are not familiar with a food blogging event, it is basically a group of people who agree to research a recipe, topic, or category of food, and then write about it by a specific deadline. This usually entails cooking something you’ve chosen (or chosen by someone else), and of course, eating! This is fairly new to me; however, I guess I’ve been doing this informally on this blog since day one. But I couldn’t possibly turn down Mimi on the Move and her request (challenge?) to whip up something from Martha Stewart herself. So I am totally, like, bring it! I’ve been around food…well all my life. My mother used to say that I was born at 11:48 a.m., just in time for lunch. So, when something new crosses my plate, it’s an exciting time for me. The current issue of Martha Stewart Living is chock-a-block with the usual crafty, homekeeping fare, except something new caught me by surprise. Upon turning to the What’s for Dinner section, I spotted a recipe for Farro and Porcini Risotto. Now, I thought I was pretty hip with new food trends, but farro was something I’ve never heard of. I made a mental note to Google it as soon as possible. From what I’ve learned, farro has a pretty glorious history as a “grain of the legions”. It was “the original grain from which all others derive” and was once as common as spaghetti is today. But, through the times, it has whittled its popularity down to primarily Italian dishes and the occasional French haute cuisine. The organic food movement has brought renewed interest in farro, and I was extremely curious to try it. Of course, my regular grocery didn’t carry farro, in fact, no one knew what it was, so off we went to Whole Foods grocery. Even in this organic and raw food mecca, there were only 3 lonely 16 oz. bags of farro to be found. And we looked hard for those 3 bags! 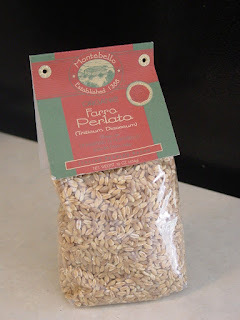 Martha’a recipe called for 2 cups of farro, so we purchased two 16 oz. bags…just in case. Next, were the dried porcini mushrooms, which ended costing a small mortgage, but again, we’re talking about Whole Foods grocery. The mushrooms weren’t easy to find either. So far, Martha’s recipe was scoring negative points for convenience and availability. Once home, I easily made the pesto sauce called for in the recipe. I substituted pecans for walnuts because, well, I don’t like walnuts and we had pecans. I used fresh basil from my garden and parsley purchased from the store. I set the pesto aside and started on the main dish. So farro, so good! I mixed the farro with some white wine, chicken broth, and the dried porcinis, brought it to a boil and waited. Now, I did notice one important thing missing in this recipe. The Standard Rule of Engagement for any risotto making process is to add warm/hot stock to the risotto while it’s cooking. The pasta needs to absorb the liquid slowly, and adding a cold stock results in hard, undercooked risotto. I figured the farro probably would react in the same way so, I heated up my chicken broth and added half a cup at a time. It worked like a charm. Once the farro had absorbed all the liquid, it was done. I added the pesto and then finished with a few gusty peels of Romano (not parmesan…my preference) cheese. 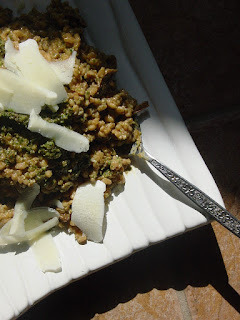 The farro tasted earthy and nutty, with a splash of green from the basil and parsley. It was chewy and creamy in all the right places. The porcinis added a smokey, woody flavor and the grated cheese gave it a salty depth. This dish is not meant for the light-hearted though; it’s hearty and rustic and would do best with any red meat, game, or harvest vegetables. It’s definitely not springtime fare. Overall, we enjoyed this dish very much and I probably will make it again if I’m in the mood for something a little exotic. Its biggest fault is the availability and price for the ingredients. Not everyone can go to or even afford specialty markets, but then again, only the best for Martha! thanks for making this yummy "risotto"! it's definitely more of a fall dish, so tsk on martha for not being seasonal. but glad you tried it. i'm sure you'll find lots of other great recipes to use the rest of those porcinis! i made this myself the other night, and i can attest to it's goodness!